The hatchery relies heavily on sponsorship and goodwill provided by local fishermen. 2007 season underway - The first hens were brought into the hatchery in early April, and by May we have the first of the stage IV larvae already in the tray room. 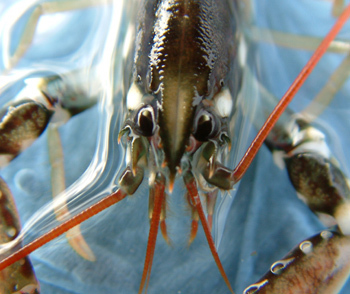 New Biological Filter sustaining 40,000 juvenile lobsters, consistently maintaining the water supply with extremely low levels of NH3, NO3 and NO2. and increasing the survivability and quality of larvae in the system. 2006 release figures published soon! 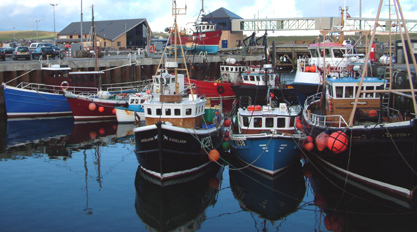 Orkney Sustainable Fisheries has been formed to ensure the ongoing success of Orkney Lobster Hatchery and to promote sustainable fishing practices. Orkney Sustainable Fisheries aims to achieve a totally sustainable lobster fishery in Orkney waters, building on the Hatchery's previous achievements. Orkney Lobster Hatchery releases are now over 100,000 juvenile lobsters annually, and is working to create a sustainable lobster fishery around the Orkney Isles. In 2002 the hatchery was rebuilt, and through its innovative design has become the most successful lobster hatchery in Europe. !